Mrs. Sarah Ellen Shore, wife of John A. Shore, passed away at the family home in Los Angeles, California, on April 24, following a long period of failing health. The body was returned to Versailles and, on Tuesday afternoon of this week, funeral services were held from the First Baptist church. The pastor, Dr. Alexander Best, officiated. Hymns were sung by the church choir. The pallbearers were J. B. Todd, Warren Todd, E. E. Archer, W. M. VanHorn, Royce Moser, Sam Morris, W. E. Nelson and Reed B. Moore. Interment was in the Versailles cemetery, under the direction of Kidwell’s Service. Sarah Ellen Hayes, daughter of the late Mr. and Mrs. James Hayes, was born January 1, 1879, in Cooper County, Mo. She was united in marriage with John A. Shore on January 9, 1901. For a period of about forty years Mrs. Shore was a faithful and active member of the First Baptist Church of Versailles, taking part in all of the activities of the church. At the time of her death she was a member of Bethel Baptist church in Los Angeles. She was a member of the Royal Neighbors and the W.C.T.U. Besides her husband, who cared for her faithfully throughout her long illness, Mrs. 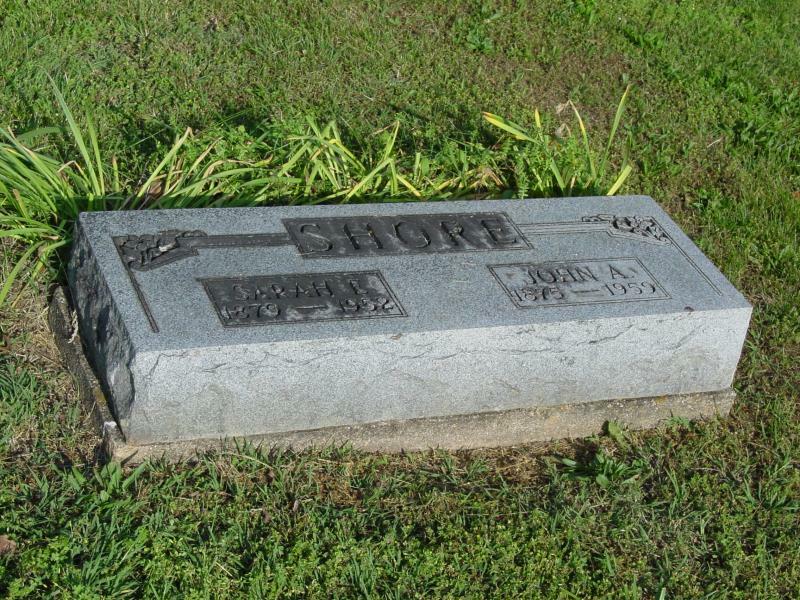 Shore is survived by two sons, Alfred and Delbert, both of the State of California; one grandson, Jerry Shore; a brother, Ed Hayes of Sedalia, many other relatives and many, many close friends, here and in California where she and her husband had made their home the past 10 years. During their residence in California Mr. and Mrs. Shore had kept up with the activities of their former neighbors and friends through the columns of The Leader-Statesman, and the editor of this newspaper shall never forget the friendly little notes penned by Mrs. Shore and mailed to us when payment for the paper was sent. She never failed to express her appreciation of the paper and the pleasure she derived from it, and the publisher of a country newspaper simply doesn’t forget those good people who take the time to say a kind word or two. But, having known Mrs. Shore these many years, and being fully aware of the sort of person she was, we can say for a certainty that her little, untalked-of kindnesses were showered upon many of her friends and relatives. It was her nature to be a kind and thoughtful person. Sarah E. Hayes [Hays] Shore was my g-grandaunt from both the Hays and the Shore family lines. She was the sister of my g-grandmother, Clara M. Hays Shore. Sarah’s husband, John Shore, was also the brother of my g-grandfather, Avery F. Shore (Clara’s husband).